I never promised that my Wednesday posts would be in the morning did I? Finding a rhythm that works with living in one place and doing my photo work in another will be a challenge but I’m thankful for the space at my daughter Emily’s that gives me plenty of room for a table, lights, props and camera! My family has been warmed by the outpouring of concern shown for my daughter Lauren since her diagnosis of breast cancer just a little over a month ago. There is nothing that can prepare you for this disease; one whose only evidence is the result of the treatment required to rid a body of those invasive cells. Her gorgeous hair is now gone but we are most grateful for the wigs available today that make this transition easier. My girl, whose hair was one of her most beautiful assets is now bald (OK, there is a bit of fuzz there!) but she has handled it with aplomb. Preferring to not feel a need to hide the ravages of this treatment; she goes to work wearing a baseball cap and clear evidence of what this treatment has done to her. Going out with friends is a different story so I bought her a beautiful brunette wig and last week a dear friend of ours offered to gift her with a 2nd one; she can now test to see if blondes indeed do have more fun! It should come as no surprise that my interest in her well-being would include investigating the best food choices for her to keep her as strong and healthy as possible. She had been eating well and working out regularly when she was diagnosed but I was still thankful for the chance recently to talk to her oncology nutritionist about her diet and I’m equally grateful to the folks from the Cancer Treatment Centers of America that provide me with regular recipes for my Wednesday posts. What I love about their recipes is that though they are specifically developed to make sure they provide the nutrition so important to people fighting this disease; my experience has just been how good they are. These aren’t ‘cancer’ foods, they are just healthy and delicious foods! Lauren’s sister and I prepared this chicken last night; it’s one of those perfect weeknight meals…not just easy to prepare but a short cooking time means on the table before your family can stage a hunger revolution! Lauren was not sure about the ginger component as she might have overdone ginger recently but I assured her it was subtle, she agreed to give it a try and ultimately gave this dish a hearty thumbs up! Served with a Roasted Vegetable Pasta (next Wednesday), it was quite simply a wonderful meal. Season chicken breasts with salt and pepper on both sides. In a large, heavy skillet heat olive oil over medium high heat; add chicken and sear until well-browned on each side, about 3 minutes per side. Transfer chicken to a plate and cover with foil. Reduce heat to medium and add scallions, garlic and ginger. Cook, stirring for 1 minute. Add chicken broth, rice wine vinegar, hoisin sauce and sugar. Bring to a simmer. Cook until slightly thickened, about 3 minutes. Return chicken and juices to skillet, reduce heat to low. Simmer until chicken is cooked through, about 4 minutes. Transfer chicken to a warmed platter. Season sauce with soy sauce to taste and spoon over chicken. Garnish with scallion greens. If you want to practice cancer-fighting cooking, add ginger. This tasty spice adds flavor to meats and vegetables without increasing the fat, cholesterol or sodium in your food. Ginger also contains ingredients that reduce nausea, improve digestion and enhance your immune system. I just love this dish. Such a great weeknight dinner! Thanks…we love it too and yes, having it be easy is a bonus! I love all the Wednesday posts and the healthy recipes that like you said, are simply healthy tasty meals. I hope Lauren is handling chemo as well as can be expected and that she continues to fight this terrible cancer. My heart breaks for your and your daughters but it sounds like Lauren is a fighter. This is a lovely recipe. Thank you Terra…and hugs back to you! Recipes have so much more meaning when you know they have been prepared with love and care. Glad you and your girls could have this lovely meal together. I look forward to trying it at my house, the sauce sounds fantastic. We loved it and I love how easy it came together…that was important to me when my kids where little and still something I appreciate today! I adore ginger…a perfect ingredient in this beautiful, healthy meal. I’m so sorry to hear about your daughter. I was an oncology RN back in the day…and cancer diagnosis and treatment have come a long way. I will keep your daughter in my thoughts…wishing for a cure for her and everyone fighting this horrible disease. Thanks Liz; she has been in so many hearts and the recipient of so many prayers that I credit all of that to some of her strength. All is appreciated beyond words. A splendid meal indeed, Barb! 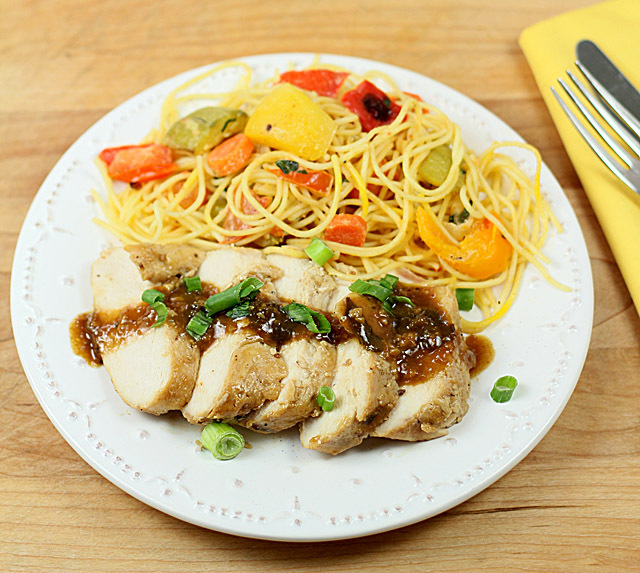 I adore ginger, and this chicken dish is exploding with flavor. I can’t wait to make it – I know my family will devour it. This is my kind of dinner, I love these flavors! I love chicken and I love pasta so I’m delighted with today’s post but for more reasons than just this lovely dinner. I’m so proud of your Lauren for wearing a ball cap to work. Her loss of hair is a symbol of her fight with cancer and I’m happy that she does not feel the need to hide it. One of the most beautiful images I ever saw was of a courageous lady named Amanda of Easy Peasy Organic, from Australia who was photographed with her baby and her husband by Juanita Broderick. Jaunita did a special magazine shoot in Australia for an article on young women with cancer. She also did further photo-documentation of Amanda’s journey to overcome cancer. One of Jaunita’s comments about Amanda’s bald head was not only how beautiful she felt she looked (which she did) but also how proud she looked, *almost in direct defiance of the reason her hair is gone*. This too is your Lauren, a defiant fighter. Bald heads, surgery scars, they are all symbols of courage of a battle no one wants to have to fight but those that must are paving a path of dignity and grace that we can only admire and support in any way we can. Going to pin this recipe! It looks delicious! Are you going to post the recipe for that pasta dish too? Thank you Tanya…and yes, I’ll post the pasta recipe next Wednesday; it was delish too! This looks absolutely delicious and just the type of dinner my family loves – this is truly a great series Barb and so valuable for so many people!!! Glad that Lauren seems to be doing well – she’s so lucky to have you and Emily as her personal chefs!! Isn’t she? I love that I am also compiling some great recipes for me too…this one was so simple and a real winner. I’ve been lucky to work with a group that develops such great recipes; I’ve loved everything they’ve provided to me. She is doing well…our fingers remain hopefully crossed that it will continue. Ginger is such a great ingredient! I didn’t know it had properties to help fight cancer, but I so love it, I use it every chance I get. Really nice recipe. Lots going on in your life, and I hope things go as well as they can. And it sounds like Lauren is a gem (something I know you already knew!). Such a good post – thanks. I thought it was delicious too. The ginger was a nice touch, but not too overpowering.